TREOIR CEO Damien Peelo talks to Ivan Yates’ ‘the Hard Shoulder’ on 7th December regarding maintenance payments, lone parent poverty, shared parenting and a child centred approach to solving issues in parenting and alleviating poverty. On Monday 3rd December the Treoir report “An Examination of the Barriers to Shared Parenting Experienced by Unmarried Fathers”. was launched by Deputy Anne Rabbitte. 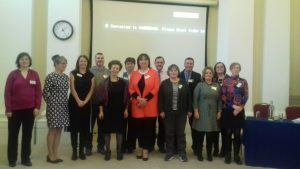 The event was attended by many community organisations, TUSLA, Barnardos, One Family, HSE Sexual Health and Crisis Pregnancy Programme, and family centred organisation.